Information for students K-6 about tropical rainforests of the world, their importance, adaptations of plants and animals, and why they are endangered. A rainforest is like a jungle. They are thick forests in hot places. It rains every day in a rainforest. There are huge trees and tiny plants in a rainforest. There are millions of animals and plants in the rainforests of the world. Rainforests are thick, warm and wet forests that get more than 250 cm a year of rain a year. They are found close to the equator, which is an imaginary line around the widest part of the earth (not pole to pole), dividing it into two halves, a northern and southern hemisphere. The equator is where the sun shines most directly onto the earth, and the area in a wide band on either side of the equator is called the tropics. Tropical weather is always hot and humid, meaning the air contains an amount of moisture. Only about half the forests in the tropics are rainforests. Rainforests only occur in places with high rainfall that are warm and frost free with little variation in temperature throughout the year . The tropical forests that are not rainforests are in places that have rainy and dry seasons, and the trees often drop their leaves in the dry season. Some forests in mountain areas may get snow and frost even though close to the equator. Tropical rainforests exist in 85 different countries, and most are in Central and South America, Africa, Asia and Australia. The largest tropical rainforest in the world is the South American Amazon rainforest, much of which lies in Brazil. The world's largest river, the Amazon, flows through it. Some tropical rainforests are called 'old growth', or 'primary', tropical rainforests, which means they have not been logged and then reforested. In the tropics it is always hot and it rains every day, so tropical rainforests are the wettest places on earth. A tropical rainforest grows in four main layers, with different trees, flowers, and other plants in each layer. Top layer is the emergent layer, the tops of huge trees as big as 100m that rise high above the rest of the forest, therefore receiving the most sunlight. The second layer the canopy, tall trees growing close together so that their tops are close, forming a fairly continuous cover. The third layer is the understorey, smaller trees, bushes, and plants such as ferns. Not much sunlight reaches here, because the canopy blocks the sun. The fourth layer is the forest floor, where few plants grow because almost no sunlight reaches it. The leaves and plants that drop from the upper layers provide food and shelter for animals and insects that inhabit the forest floor. Why do tropical rainforests have so many species of plants and animals? There are billions of species (kinds) of mammals, insects, birds and reptiles found in tropical rainforests, so many that scientists do not yet know all the species, and new ones are still being discovered. In total, in the different countries, about half of all the world's animal species live in tropical rainforests, in all the layers of the forest. It is estimated that there are more than 50 million different kinds of insects alone in tropical rainforests. In fact, almost 50 different species (kinds) of ant were found on one tree in Peru. The reason there are so many species is because rainforests are very old, some almost 100 million years old, which means dinosaurs probably lived in them. About 10,000 years ago the ice caps at the poles spread out in an Ice Age, but the ice didn't reach the equator so tropical rainforests survived and their plant and animal species continued to evolve when other places on earth had to start growing plants all over again. Many of the plants have fruit that provides food for animals and people and many rainforest plants are gathered for medicines. This is done without harming the rainforest. Many 'every day' foods originated in rainforests, including tomatoes, capsicums, corn, rice, coconut, banana, coffee, cocoa, cassava (tapioca), beans and sweet potatoes. In order to survive in the hot, wet tropics, plants of the tropical rainforest have had to develop special features. Because the weather is hot and wet, trees do not need thick bark to slow down moisture loss and have instead thin, smooth bark. The layers of rainforest are connected by vines and ferns, and mosses grow on the trees. Liana is a climbing vine that grows on rainforest trees, climbing into the canopy so its leaves get more sunlight. The leaves of rainforest trees have adapted to cope with the large amount of rain. The leaves are big, thick and waxy, and have 'drip tips' to let the rain drain off quickly. Many large trees have huge ridges called buttresses near the base. They may be 10-12 metres high where they join into the trunk. They increase the surface area of a tree so that it can 'breathe in' more carbon dioxide and 'breathe out' more oxygen. Nutrients in the soil are near the surface in rainforests, so the big trees have quite shallow roots and the buttresses support the trees. Some trees have above-ground roots called prop or stilt roots which give extra support to the trees. They are similar but prop roots grow from the main stem and stilt roots grow from other stems as well. Both help secure the plant to the ground . These roots can grow about 85 cm in a month. Some tropical rainforest plants are carnivorous, or meat-eating. They have a cavity filled with either sweet or terrible smelling nectar that attracts insects, especially ants and flies. Inside, the sides are steep and lined with downward pointing hairs. Insects enter and lose their footing or are prevented from leaving because of the hairs. One of the rafflesia plants in Southeast Asian rainforests, produces the biggest flower in the world. Thousands of flowering plants grow onto trees so they get sunshine. Their roots are not in soil, and the plants get their food from air and water. Plants that do this are called epiphytes (say epp-ee-fights), and include orchids, philodendrons, ferns and bromeliads. Bromeliads are native to the Americas. Bromeliad leaves form a central 'tank' where water collects. Small creatures such as tiny crustaceans, mosquito and dragonfly larvae, tadpoles, birds, frogs and salamanders often live there. Some bromeliads grow in soil, but most grow on tree branches. Tropical rainforests are almost perfect for animal survival. It is always warm, and there are no changing season bringing times of food shortage. There is shade from the heat and shelter from the rain. There is no shortage of water. Because there are so many creatures living in the rainforest, there is a great deal of competition for food, sunlight and space, so animals have developed special features in order to survive. This is called adaptation. Some animals became very specialised. This means that they adapted to eating a specific plant or animal that few others eat. For example, macaw parrots and toucans eat nuts, and developed big strong beaks to open the tough shells of Brazil nuts, which other animals can't crack. South and Central American leafcutter ants grow their own food! They climb tall trees and cut small pieces of leaves which they carry back to their nest, even though they are about 50 times the ants' weight. The ants bury the leaf pieces, and the combination of the leaves and the ants' saliva encourages the growth of a fungus, which is the only food these ants eat. Sometimes there are relationships between animals and plants that benefit both. Some trees depend on animals to spread the seeds of their fruit to distant parts of the forest. Birds and mammals eat the fruits, and travel some distance before the seeds are passed out in their poo in another part of the forest, where they germinate and grow. One problem with specialisation is that if one species becomes extinct, the other must adapt or become extinct also. One example is that of the dodo and the calvaria tree. The dodo, a flightless bird of Mauritius, became extinct in 1681. A few years ago, it was found that there were just 13 calvaria trees left on the island, each over 300 years old, nearly at the end of their life. Scientists worked out that the seeds had to pass through a dodo's digestive system before they could germinate (begin to grow). With no dodos, it seemed that the tree species were doomed, but domestic turkeys were tried, and some seeds have been successfully germinated. Many rainforest animals use camouflage to 'disappear' in the rainforest. Stick insects (phasmids) are perfect examples of this. There are some butterflies whose wings look like leaves. Camouflage is of course useful for predators too, so that they can catch prey that hasn't seen them. The Boa Constrictor is an example of a camouflaged predator. The South American three-toed sloth uses camouflage and amazing slowness to escape predators. Green algae grows in the sloth's fur, which helps camouflage it in the forest canopy. Sloths are among the slowest moving animals of all (inside too, as it takes about a month to digest food). They hang from branches in the canopy, and are so still that predators such as jaguars don't see them. Some animals are poisonous, and use bright colors to warn predators to leave them alone. There are several species of brightly colored poison arrow frogs. Native Central and South American tribes used to wipe the ends of their arrows onto the frog's skin to make their arrows deadly poisonous. Rainforests actually create the rain that gives them their name! As water evaporates from the forest back into the atmosphere, it forms clouds above the rainforest. The clouds release the water back as rain, which evaporates into the atmosphere, and so on in a cycle. Rainforests affect the rain and weather patterns in other parts of the world. Removal of the forests can change the rainfall patterns elsewhere. Rainforests are important for many reasons. Very importantly, the plants clean the air. By absorbing carbon dioxide they help slow down the greenhouse effect. Rainforest trees store carbon dioxide in their roots, stems, branches, and leaves. Destroying the rainforests causes carbon dioxide to be released, which makes the greenhouse effect worse. There are many plants in the rainforests that have not yet been discovered, and there is some proof that there may be rainforest plants that could help cure many serious diseases. Many rainforest plants are already used in medicine. Rainforests occupy about 7 percent of the world's surface, yet are home to about half of all plant and animal species on earth. They have been home to some cultures for many thousands of years. They are unique and beautiful places. Rainforests are endangered. They are disappearing rapidly. This is called deforestation. Almost half of all tropical deforestation has happened in South America. Farming: farmers in rainforest countries are often poor and can't afford to buy land so traditionally they clear some rainforest and plant crops. The soil is not rich, so they can't keep farming the same spot. They move on and clear another space. The rainforest disappears bit by bit. Ranching: ranchers clear large areas of rainforest in order to graze cattle. It doesn't cost them much to get the land, and they continue to clear more and more rainforest and raise and sell more cattle. In Southeast Asia, rainforest is cut down to be replaced by palm plantations. Palm oil is an ingredient that is used in many common items used in western countries, such as shampoos, soaps, chocolate bars, frozen foods. Logging: Rainforest timber is used for building, furniture, pulping for paper products. Rainforest that was chopped down can grow back over a long time, but will never have the same variety of plants and animals they once did. Many will be extinct. 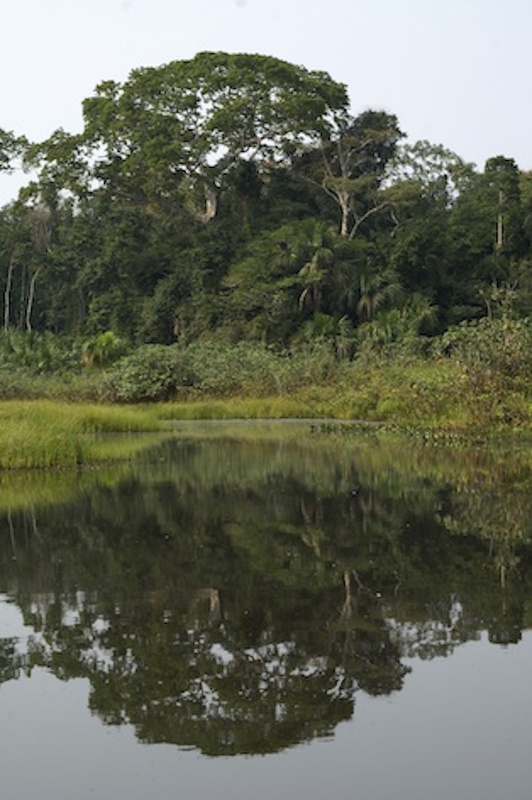 Scientists believe that destroying rainforests helps make the earth's temperatures warmer. Without rainforests, we will have less rain, which will affect the trees and plants that help to keep the air clean. The earth could become increasingly dry. Warmer temperatures may cause the ice caps to melt, which will make the seas higher, flooding low-lying areas. There are many species of animals and plants found only in specific rainforests that will become extinct if the rainforests are completely destroyed. For example, the critically endangered orangutans are found only in the rainforests of Sumatra and Borneo, Sumatran tigers only in Sumatra, and their numbers are so low that they may be extinct in just a few years. It is estimated that about 35 different kinds of tropical rainforest animals or plants become extinct every day. Extinct means gone forever. While large animals need many hectares in which to live, there are many small creatures who occupy a small enough area to be totally wiped out by one day's bulldozing. Destroying a habitat affects all living things of that area. Read about biodiversity. Read more tropical rainforest facts here. Go here to read kidcyber's page about temperate rainforests.